This title from BetSoft has a fantastic movie-style premise and is just perfect for Halloween. A young couple finds themselves stranded in the middle of nowhere. They come across a creepy haunted house that they decide to seek help at. However, all is not as it seems. Welcome to the House of Fun! The game has that great art style and the solid animation we’ve come to expect from BetSoft. In addition, it has some frighteningly fantastic features. All this combines to create a title that has great replay value, as well as a strong atmospheric charm. Great atmosphere. The theme, visuals, and music all combine to create a title with a memorable look and feel. Lots of gameplay variety. Thanks to House of Fun’s diverse side games and features, players will likely enjoy it on multiple occasions. Real movie quality. The cutscene to begin, and the lush animation throughout draws the player in and creates a game that feels like it could easily be a Hollywood Blockbuster. Low main game prizes. Some slot machines offer 5,000-10,000x the line bet for matching five symbols across a win line. This makes House of Fun’s 150x look dismally small. Small upper betting limit. Although House of Fun has a larger than average upper betting limit for a BetSoft game, it is still frustratingly small amongst its peers within the industry. Creepy men = 150x the line bet. Man in top hat = 120x the line bet. Moustachioed man = 90x the line bet. Cat = 60x the line bet. *Payouts if you play one bet per line. 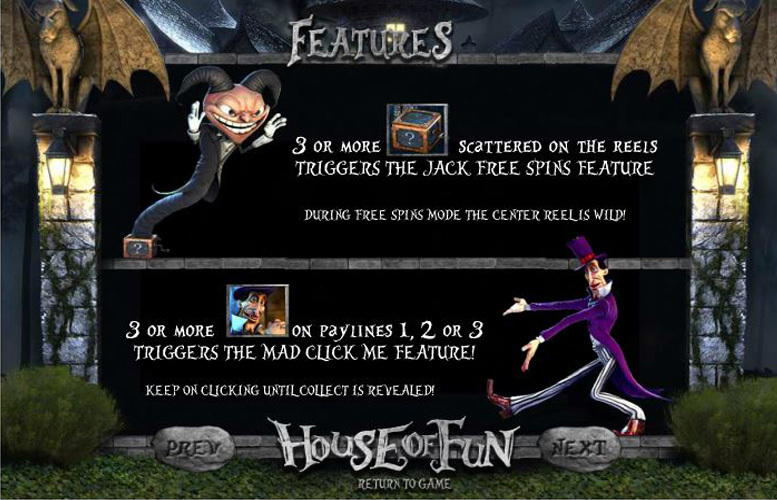 Landing three or more mystery box “scatters” on the reels will trigger the jack free spins feature. What’s more, during the free spins, the centre reel is “wild”. This means players have a considerably higher chance of hitting a pay-out. Landing three or more of the mad hatter symbols on pay lines one, two, or three will trigger the mad click me feature. Here, players can continue clicking until they reveal “collect”. 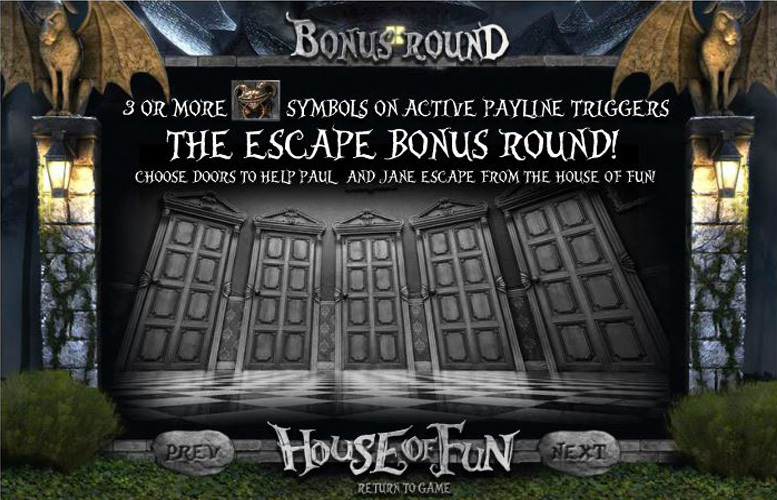 Landing three or more door knocker symbols on an active pay line will trigger the “Escape Bonus” round. Here, players must choose doors to help the young couple escape from the House of Fun. Guess correctly and there’s some juicy bonus cash on offer. Gargoyle, or candelabra = 50x the line bet. Portrait, or mirror = 30x the line bet. 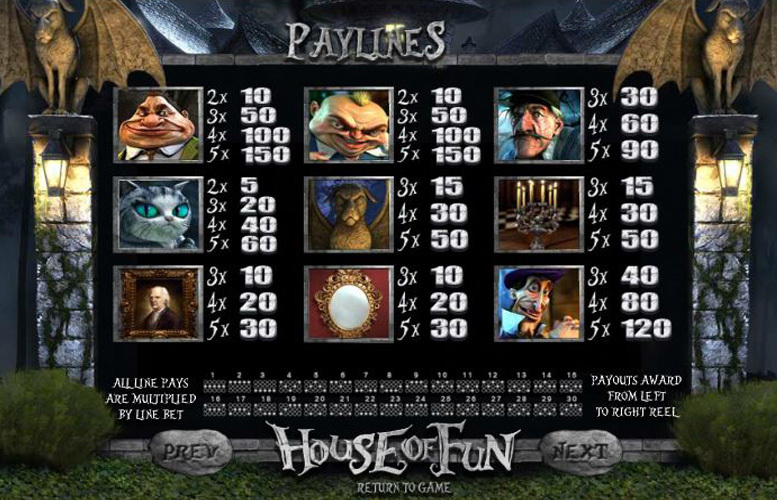 Players are given maximum choice over how they distribute their bets over the reels in House of Fun. They can adjust the value of every coin between 2p and £1, and they can change the number of lines active at once. Here, the minimum is just one, and maximum is all 30. Finally, they can alter how much is bet per line. The range for this variable is between one and five. With all values set to the minimum, the lowest possible bet per spin is just 2p. Meanwhile, with everything maxed out, the largest bet per turn is a somewhat underwhelming £150. Whilst this is large for BetSoft games, it will most likely put some of the highest rollers around off. This one’s certainly another triumph for BetSoft. It uses great animation and bonus features to complement a strong theme. This results in a package that is engaging, entertaining, and most importantly, potentially lucrative. As with most BetSoft games, however, there are a few drawbacks. These mostly relate to the low upper betting limit, as well as the small main game prizes. These flaws certainly won’t bother every player though. 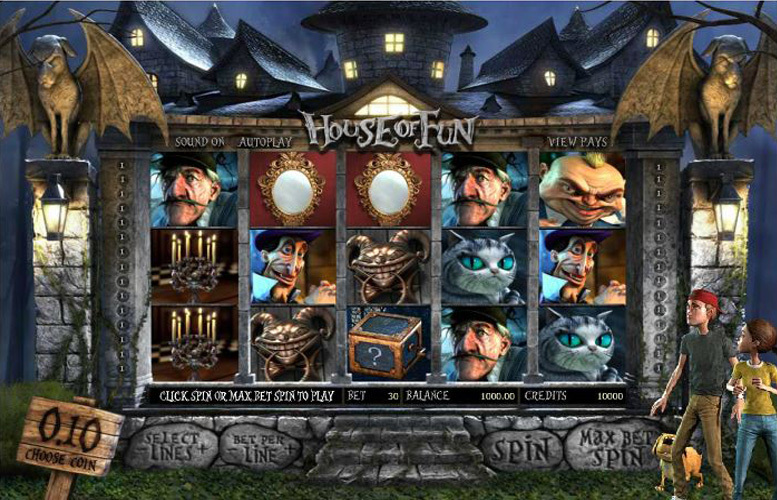 If you can look past them, and dare set foot inside, the House of Fun might just be the perfect slot for you. This game has a rating of 4 / 5 with 514 total reviews by the users.